My favorite thing about blanket scarves is the way they embrace you entirely. It's easy to wear this draped over your head, around the neck, and to cuddle yourself under at home. This winter has definitely made me upgrade my wardrobe to better quality staples that are versatile. It's important for me to be able to mix things up a little bit so although my outfits are mostly composed of simple pieces, I love being able to mix and match different colors and textures. As Lent has begun, I've given up on purchasing any new clothes until easter, so let's see exactly how many looks I can put together without any new buys. In addition to this, I've also given up coffee... yikes. Wish me luck! GIRL!!! 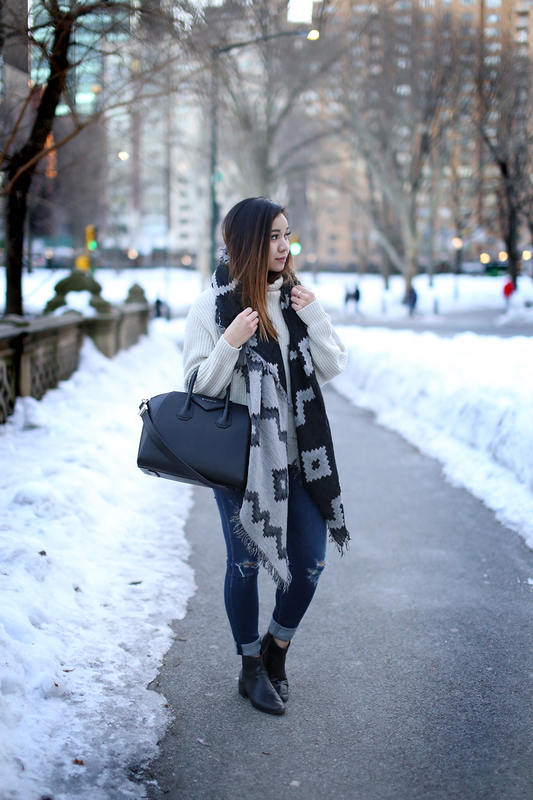 I am OBSESSED with your scarf! I love Aritzia they always have the best stuff. These photos are beautiful! You don't look cold at all! Thanks so much! I love it too but definitely have had to watch my spending in that store! It's bad, haha. You're giving up what for Lent?! Shopping and Coffee? May the lord be with you. Ha I'm currently on a no-buy because I'm saving up to buy a new camera, so I can upgrade my blog photos, but for Lent I want to floss every night. I always end up being too tired or I forget. I hoping that within the next few weeks I'll form a habit and continue flossing daily. Yeah, so far I haven't caved so I'm definitely going to reward myself with a nice shopping trip and beautiful latte by the end of it! Haha. And that's great! What camera? I recently upgraded to a Canon 6D, so I'm trying to sell my Canon T3i now.